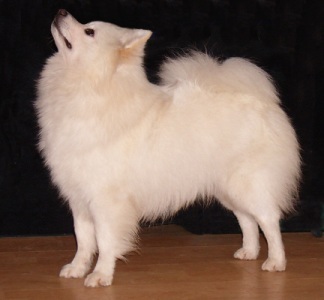 Dilli is from my first litter of German Spitz, as soon as she was up on her feet it was apparent that she was a real live wire! Loveable, excitable, fearless, tireless, determined, independent, in your face and super affectionate she is everything I love about the German Spitz. Through no fault of her own she was shown very lightly as a puppy but did very well when she did get out in the ring.